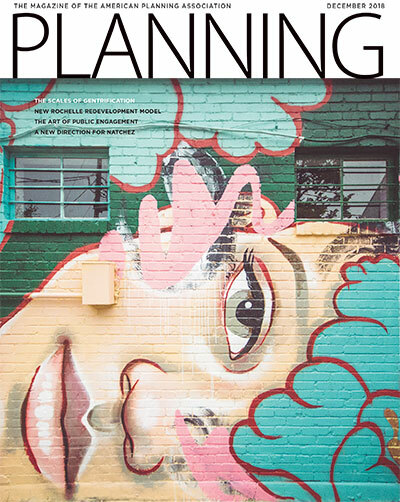 The theme of equity runs through the December issue of Planning. In Detroit, Atlanta, and Chicago, planners are trying new ways to revitalize neighborhoods and avoid gentrification. Natchez, Mississippi, developed a downtown plan that, for the first time, reflects input from both white and black residents. In Intersections, "We Ask, You Answer" invites readers to describe their communities' strategies for equitable growth in 2019. Cities strive to find the balance point between urban revitalization and gentrification. Pete Saunders reports. Planners and communities are getting creative with the planning process, writes Erick Mertz. The New Rochelle Model is an innovative, market-based redevelopment process. And it’s working. Story by Luiz Aragon, Daniel Marsh, and Seth Pinsky. A struggling Southern city with a racially divided past takes a big step to create prosperity for all. Philip Walker and Keith Covington explain. Chapter conference catch-up, APA Learn, Foundation Community Assistance recipients named. Which strategy will your community use to ensure growth is equitable in 2019? Tulsa park, transportation to polls, contactless transit fares in Philadelphia. Takings case heard by the Supreme Court. Tim Beatley takes a tour of catios and bird conservation efforts in Portland, Oregon. Parking, Cleveland, free public transit. Redlining, City Dreamers, Surveyor app. Cover: Photo courtesy Oklahoma Mural Syndicate.